You have to go back a long, long way to find the last time that the men’s 10,000m Olympic gold was won by an athlete NOT from Ethiopia. Barcelona, 1992, to be precise, where Khalid Skah of Morocco beat Richard Chelimo in a controversial race. There are two words I’d use to describe this race. The first is INEVITABLE. It had an air of “sameness” to it, since Bekele was always going to win the race in the final 400m. It was like watching a rerun of every other major 10,000m final since 2003, with the possible exception of last year’s race in Osaka, where Bekele was actually challenged. Today he was not. Which is why the second word for this race is PECULIAR. It was, to be frank, a bizarre race. There was never a moment of drama, and if it was not such a fast race, an impressive performance of control by Bekele, the race would have been…boring. Last year in Osaka, a combination of great front running by Zersenay Tadese and the competitive presence from Kenya’s Martin Mathati made the race exciting. This time around, they tried, but just seemed to lack that edge to force the defending champion to extend himself. 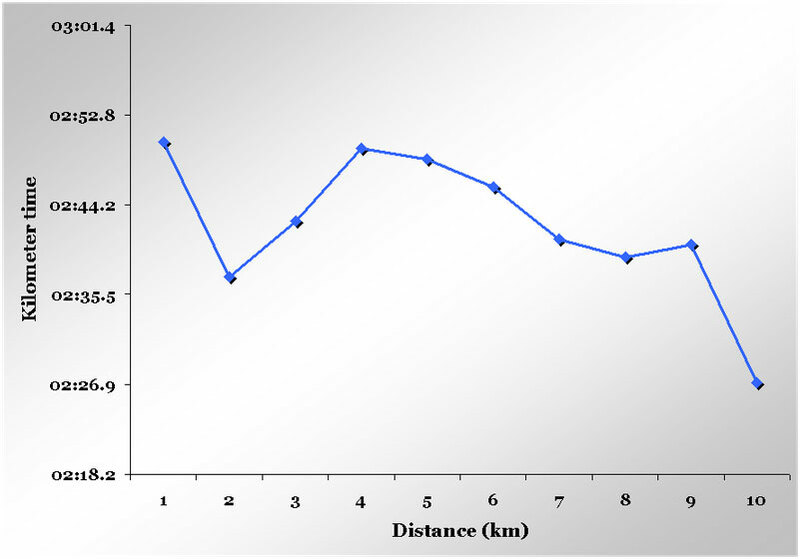 The graph below shows the kilometer times during the race. Really, I expected a lot more from the Kenyans and Eritreans. Even Gebrselassie, who would never in a million years have the speed to survive on a last lap sprint, did not inject some speed into the race during the middle stages. He did take the lead at one stage, but then bizarrely slowed the race down. He was content, as were the others, to run “conservative” laps in the 64 to 65 second range. Perhaps they simply didn’t have the legs. If it was a conscious decision to sit in, then their tactics were really difficult to understand. The Eritreans tried their best – there were clear team tactics from them. After a very slow start (2:50 for km 1), two of their lesser atheltes went to the front and pushed the pace…sort of. They did the second kilometer in 2:37, but couldn’t keep it going, and soon, the pace fell into the mid 2:40′s, which is fast, but easily manageable for the top runners. The problem was (and this was the trend for the rest of the race) that runners were going to the front and doing very little damage to the race. Even the surges were “only” being done at about 64 sec/lap pace, which is just not enough to shake anyone off. As a result, the leading group was huge, all the way up to about 7000m, when finally, Zersenay Tadese put in the most explosive lap of the race – a 61 second lap with 8 to go. That move shook the race up a little, but he was unable to keep it going for even one more lap, and pretty soon, the race settled right back into the mid-60′s, which meant everyone was just going through the motions until the bell. So Bekele now moves on to the 5,000m, and it’s difficult to see who will challenge him there. As with the 10,000m event, there seems to be a real lack of depth among the Kenyans, and a particular lack of competitive racing ability. Bernard Lagat, the world champion, does not appear to be in great shape, as he couldn’t even make the 1500m final. So it seems that Bekele, if he runs the 5,000m, might just add a third gold medal to his collection. Let’s hope someone throws a challenge at him.